You can tell a lot about Marly Bird just by the hats she wears. She is an avid crocheter and knitter who loves to share her passion with students. Balancing her day as wife, mommy, designer, National Spokesperson for Red Heart Yarns, teacher and podcast host is a challenge, but Marly wouldn’t change any of it. But how did she become a crochet and knitwear designer? Marly learned to crochet in 1999 from her grandmother and in 2004 learned to knit from a dear friend. From the moment she picked up the hook and needles Marly knew that she had to be a part of this industry. In 2006 she quit her job to do just that. Her first adventure into this crafty business was to begin a podcast. 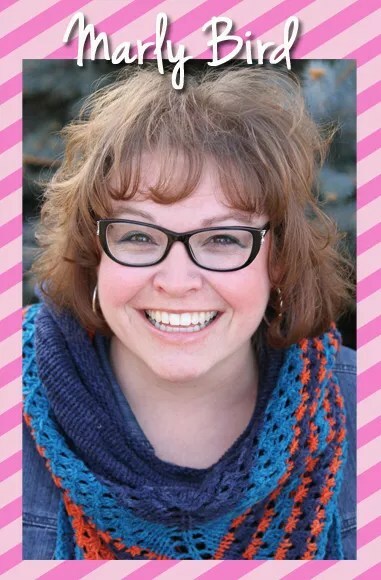 With a BA in Speech Communication from Colorado State University, it seemed that a podcast all about her love for crochet and knitting was a logical step for Marly to make. Since Marly is bi-crafty, she focused her show on both crochet and knitting. Also, little known fact, her podcast was the FIRST CROCHET podcast on iTunes! She named the show Yarn Thing Podcast because it really is all about the yarn and not the medium you use to work with it. No rivalry between the two crafts on her show! Doing the podcast must have been a good start because it was on her podcast that she made connections with some of the highly talented people in the industry and even began to review for such publishers as Vogue, Interweave, Martingale, F&W, XRX, Potter Craft, and Leisure Arts. Wanting to move even farther into this industry, Marly decided she would venture into the world of design. After all, she never really followed patterns instead choosing to alter this, that, and the other to make a piece her own. Well, after some gentle proding from some of her friends and family (as well as a couple of her favorite designers) she attended her first TNNA in June of 2008. Why TNNA? Marly was told that if she wanted to really “BE a DESIGNER” she had to go to this trade show and connect with the leaders of this industry. So, she did just that…and again, it paid off! It was at this first show that she met the owners of Bijou Basin Ranch luxury Yak Fiber. Soon after she began to design for them and she is now their Creative Director. What an adventure! It has been an wild ride since her first published patterns in Fall of 2008 (Fino Mittones, Interweave Crochet Fall 2008 and Eyelet Hat and Scarf, Knit Simple Magazine Holiday 2008). Marly is author of I Can’t Believe I’m Knitting Entrelac (Leisure Arts, 2013), co-author of Knitting for Dummies 3rd ed. (Wiley, 2013), Curvy Crochet: fashion for the plus size woman (Leisure Arts, 2010), published in some of the top magazines in the world, has patterns in collaborative books, works for a variety of yarn companies, is project manager for the patterns of a new yarn line and independently publishes her own patterns. When asked about her design style, Marly says she likes to design items that she would want to use or wear. Most of her designs are sized from S to 3x as she understands the need for quality plus size garments for knitters and crocheters. She likes to make pieces that are stylish, sophisticated and yet down to earth. After only a few short years, this talented designer has accomplished so much that it is not hard to believe that the sky is the limit for her. Marly believes that with the grace of God nothing is impossible and that it is never too late to make something that is your passion into something that is your profession! Since she becoming a designer in 2008, Marly is getting paid to actually play with yarn; what could be better than that?